I am a self-proclaimed failure in the kitchen, but perhaps my luck is changing. Maybe all of my hours of poring over Pinterest recipes have paid off–or maybe I’m just lucky. Earlier this week, my mom and I made delicious mozzarella, tomato and basil sandwiches on sourdough bread (my idea!). We sliced the mozzarella, quickly dipped it in some balsamic vinegar, we sliced tomatoes as well and put them all in the oven for a few minutes to get the bread toasty and the cheese melty. When they came out of the oven, we put basil on them and then served them up! We paired them with roasted tomatoes, peppers, onions, mushrooms, squash and zucchini tossed in a tiny bit of olive oil and seasoned with salt and pepper. That was success #1 in the kitchen this week. 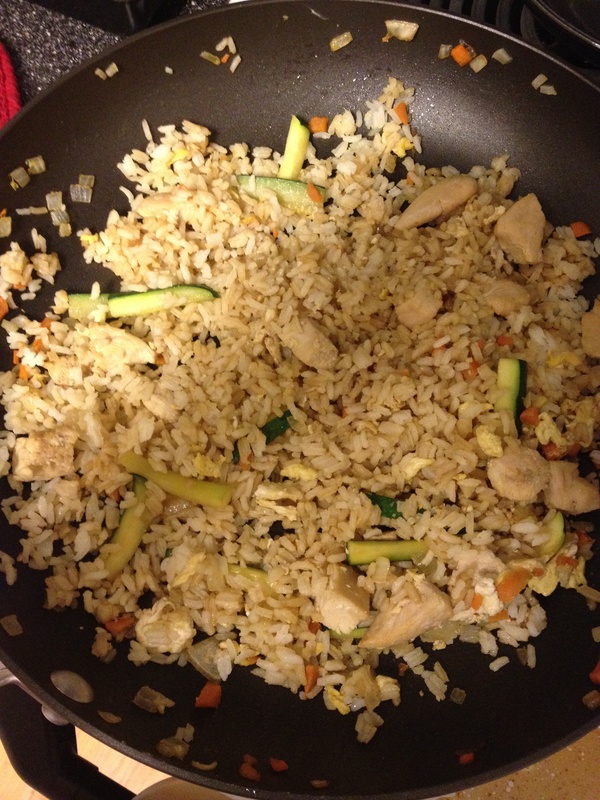 Success #2 was chicken fried rice. I started by cooking two frozen chicken breasts in an 8″ x 8″ glass dish covered in aluminum foil. I put a few pats of butter, a little bit of soy sauce and a little bit of the onion (about a quarter of the diced onion). Every once and a while I turned the chicken breasts over. The directions on the package said that it should take 22-26 minutes to cook, but took closer to 30-40. When it was done cooking, I used kitchen shears to cut the chicken into cubes. While that was cooking, I prepared 2 cups of uncooked rice per the instructions on the rice box. When my rice finished cooking, it was soggy! I tried leaving it on longer and it wasn’t getting any better. Ew! But, I read online that if you spread your rice thin on a plate and microwave it for a few minutes, then fluff it with a fork, it helps dry it out. So, I tried it and it worked! Wooohoo! 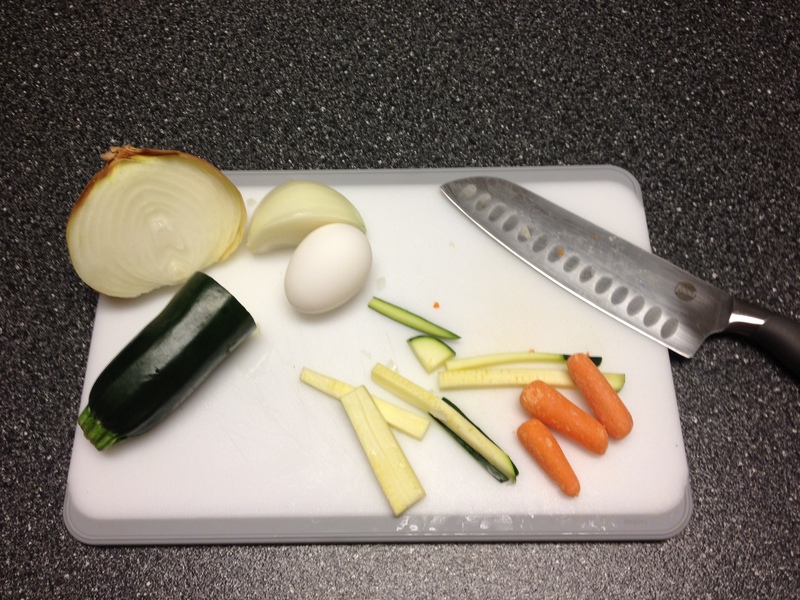 While I cooked my rice and my chicken, I cut up my vegetables. When the rice and chicken finished cooking, I put a few more pats of butter in my frying pan with the rest of the chopped onion, the zucchini, and the carrots and sauteed them for just a few minutes. I added the egg and a little soy sauce and I scrambled the egg in the pan until it was cooked. Then, I added the chicken and rice and stirred it all together. I put more soy sauce (but not too much) in and stirred it all together one last time. Now, if someone would just clean the kitchen for me, I’d be all set!